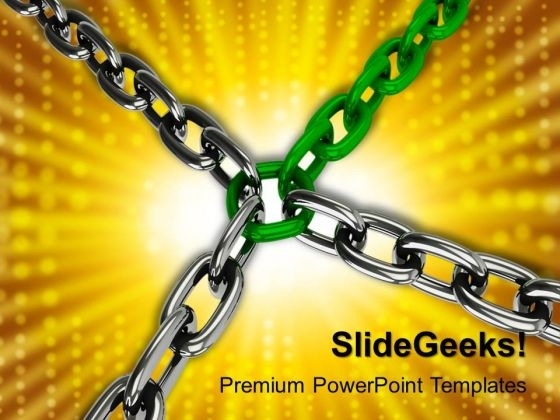 Chain Security PowerPoint Templates And PowerPoint Themes 1012-This PowerPoint template consists of an image of many linked chains connected to one circular green chain. This image represents the concept of security or steps of business strategies. This template also emphasize strong group between family, business etc. Present your views using our innovative slides and be assured of leaving a lasting impression. -Chain Security PowerPoint Templates And PowerPoint Themes 1012-This PowerPoint template can be used for presentations relating to-"Chains of design, communication, security, business, teamwork, industrial" Set a good example with our Chain Security PowerPoint Templates And PowerPoint Themes 1012. Be the benchmark for others to follow. Advertise yourbelief in your ability. Our Chain Security PowerPoint Templates And PowerPoint Themes 1012 will help back up your boast.